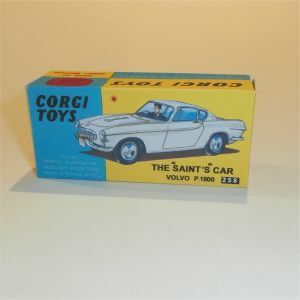 Based on the original Corgi Toys Volvo P1800 model casting, this model involved adding a driver and the Saint decal to the bonnet (hood) of the car. This reproduction box is for the Corgi early issue #258. The last photo compares the 258 Saints Car box with the 228 Volvo P.1800 coupe box.